Worth the hype? 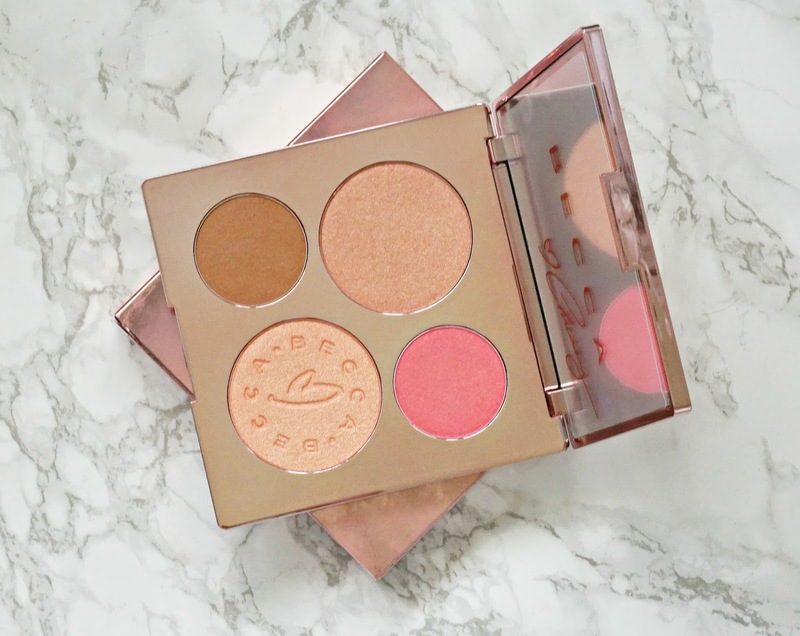 BECCA x Chrissy Teigen Glow Face Palette & GIVEAWAY! Unless you've been hiding under a rock, you will know that the new BECCA x Chrissy Teigen palette was released this side of the Atlantic last week. I told myself that I wasn't buying it because I didn't think it would work on my skin tone, plus I really don't use the Jaclyn Hill Champagne Palette, which was released last year, very much but then my lack of willpower kicked in and I had some points on my reward card so I just gave in and ordered it! I'm a big fan of Becca (brand focus post here) so I knew that I wouldn't be disappointed by the quality, it was just a case of it I could make the shades work for me. Keep reading to find out how to win a palette for yourself too! 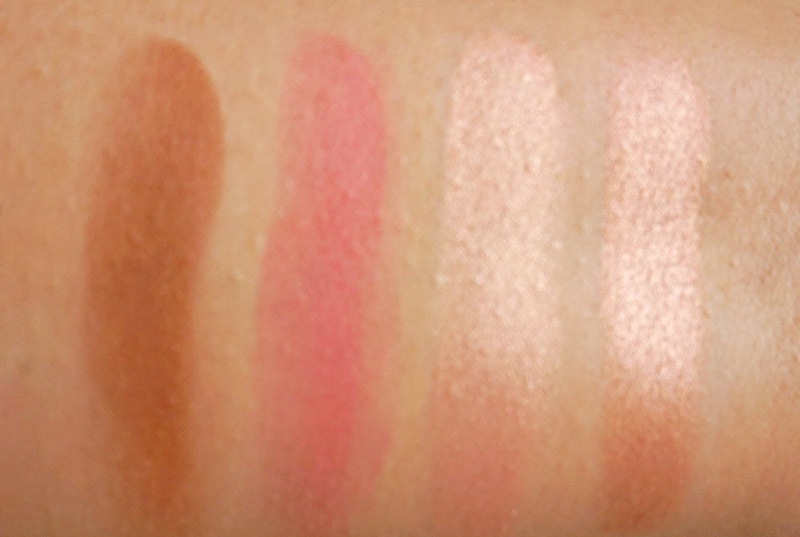 The palette contains two highlighters, one blush and one bronzer - two of which are new and limited edition, as is the palette itself. The highlighters are 5.1g each and the blush and bronzer are 2.4g each and inside the stunning pink packaging is a large mirror. As always, it's the highlighters that appealed to me the most (I seriously have a problem with highlighters), so I am glad that they are in the larger pans as I will use those more often than the blush and bronzer. Rose Gold is a beautiful, warm shade that will only work on certain skin tones - in fact, I think the whole palette will really only flatter medium to dark skin tones. The texture of this highlighter isn't quite as soft as Champagne Pop, yet it still applies and blends very easily without the presence of any glitter. Beach Nectar is my favourite of the two highlighters because I'm a sucker for a peachy/coral tone and it is similar in texture to Champagne Pop. Again, it is quite warm in tone and I find that I just need the lightest dusting of this to achieve the sheen that I want, however it is buildable. Hibiscus Bloom looks a little scary in the pan, but it blends well and works well when applied with a very light hand because it is buildable. It has some subtle shimmer but nothing that makes pores look more obvious and it works so well with the two highlighters. Malibu Soleil is quite a dark bronzer so at the moment, it doesn't work for me on my face but I love to use a little bronzer on my eyes when I can't be bothered going through my eyeshadow collection so I will continue to use it in that way. I am going on holiday soon so maybe it will be more flattering on me then for trying to match my face and body, but either way, it won't go to waste. Overall, I absolutely think this palette is worth the hype and I would go as far as saying that I prefer it to the Champagne palette from last year because I found some of the blushes in that palette a little too bright for my skin tone. I'm really glad I bought it in the end - lack of will power can be a good thing sometimes! If you would like to win this palette for yourself, then head on over to my Instagram where I have teamed up with my friends Dagmara, Leanne and Dorota to give one of these palettes away. I'd love to hear your thoughts on this palette? Are you going to buy it?